Uric acid is produced from the food you eat and the natural breakdown of your body’s cells. Most of this uric are filtered out by the kidneys then passed out of your body through urine. Yet, the level of uric acid in the blood gets too high when the kidney can’t remove it by themselves or when the body is producing too much uric acid. 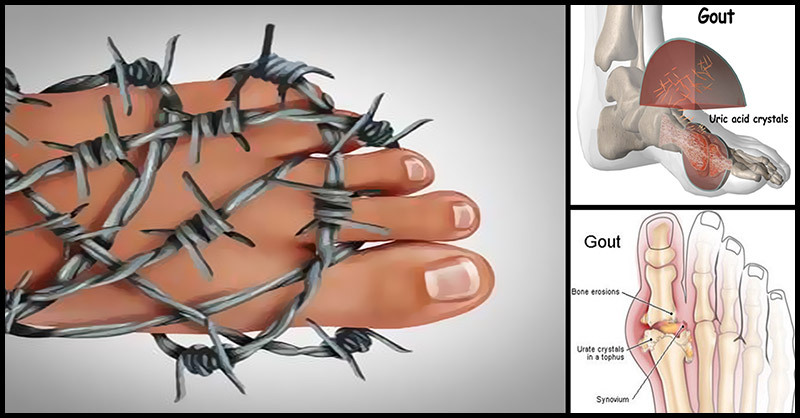 This high levels of uric acid can cause a painful and common condition called gout. This happens when crystals form within the joints. Additionally, high levels of uric acid can also cause kidney failure or kidney stones. In order to help the body excrete uric acid effectively through urine or produce less of it, a number of natural ways are available. Purines are chemical compounds found in food which is converted into uric acid once digested by the body. Diets high in purine leads to a greater potential for gout or higher uric acid levels. Foods that should be limited in a healthy diet because of its high purine content include oily fish, beer, and red meat. Fruit juices and soda are fructose-sweetened drinks that cause excess uric acid production. A person can have a greater occurrence of gout if he drank over six servings of fructose drink each week. In order to stabilize uric acid to a normal level, one must drink plenty of water. It has the ability to dilute the acid and stimulate the kidneys to eliminate it more effectively. The risk of gout can be increased by drinking beer and wine. According to a study, a person’s risk of a gout attack can be increased by 36% with one serving of liquor or beer in a 24 hour period. The risk increases by every drink consumed thereafter. Additionally, wine doubles the risk with just one or two servings. It is recommended that one’s diet must be added with strawberries, blueberries, and cherries. Fruits like cherries and dark berries contain chemicals that help reduce uric acid levels. The blue-colored and purple berries have flavonoids called anthocyanins that help in reducing stiffness and inflammation and lower the uric acid level. When vegetable oil is processed or heated, it turns into rancid fats. These fats destroy the body’s vitamin E - which plays a vital role in controlling uric acid level. On the other hand, olive oil’s monounsaturated fats remain stable even at high temperatures. It has anti-inflammatory and anti-oxidant properties and is also high in vitamin E.
Vitamin C increase the ability of the body to excrete uric acid. You may opt to increase your intake of it through your diet or you may also take supplements. Foods that are naturally high in vitamin C include tomatoes, strawberries, bell peppers, broccoli, lemon, and oranges. Obese people are at high risk of gout. They produce more uric acid and their kidneys don’t remove it quickly. For those who are obese, the risk of gout is almost doubled. In order to start reducing high levels of uric acid, simple dietary and lifestyle changes are needed. You must intervene naturally before you get to the point of a painful condition. See a doctor if you are experiencing pain and swelling in your joints especially the knee, ankle or big toe.